I am associate professor in Gender & Women’s Studies and History. I specialize in histories of women, gender and race in Scandinavia and the Atlantic world. 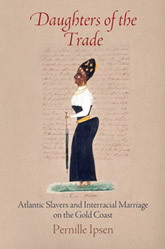 My first book, Daughters of the Trade: Atlantic Slavers and Interracial Marriage on the Gold Coast (2015) is a history of interracial marriage in the Danish-Norwegian Atlantic slave trade on the Gold Coast (present-day Ghana), 1700-1850. My second book-project, Et åbent øjeblik [An Open Moment], is a collective biography of the feminist commune I lived in as a young child in Copenhagen. Centering on specific life-experiences of seven women who lived amid women’s and lesbian politics in the early ’70s, I explore a moment filled with such possibilities for radical change in our understanding of gender and sexuality that its effects reverberate today. Pernille Ipsen. Daughters of the Trade: Atlantic Slavers and Interracial Marriage on the Gold Coast. University of Pennsylvania Press, 2015. Book: Et åbent øjeblik: Da mine mødre gjorde noget nyt. Gyldendal, forthcoming. “Plant ikke Upas-Træet om vor Bolig” [Do not plant the upas tree by our home]: Colonial Haunting, Race, and Interracial Marriage in Hans Christian Andersen’s Mulatten (1840).” The Journal of Scandinavian Studies 88:2 (2016), 127-156. Pernille Ipsen: “”The Christened Mulatresses”: Euro-African Families in a Slave trading Town” in The William and Mary Quarterly (April 2013). “Døde rotter under Christiansborg” in Kampen om Danmarks Slaver, edited by Frits Andersen and Jacob Ladegaard (Århus: Århus Universitetsforlag, 2017), 47-65 [“Dead Rats Under Christiansborg” in The Battle over Denmark’s Slaves]. Editor + co-author of the introduction of a special issue of the journal Itinerario about “Nordic Colonialism” based on a collection of papers presented at three conferences hosted in our network “Global Cultural History“.